Elysia grew up in Adelaide and from an early age was drawn to the performing arts. She trained as an actor at Actors Ink, SA Casting and Urban Myth. Elysia was accepted into the Actors Ink Elite Ensemble and Performing Troupewhich gained her work in stage and film. In 2008 Elysia was cast in the lead role as Nicole in the Short Film Hard Rubbish for which she received a nomination for Best Actress in the SA Short Film Awards. Whilst at school Elysia performed in many school-based and independent theatre productions. Elysia was awarded a Performing Arts Scholarship at Scotch College, Adelaide and was the recipient of the Pelican Productions Excellence Award for Musical Theatre. 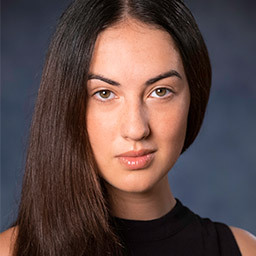 Elysia’s first major theatre role was that of Maleficent in her high school production of Sleeping Beauty, she went on to play Miranda in the University Senior College production of The Tempest. In 2011 she performed the role of Charlotte, in the Galleon Theatre Company’s production of Michael Palin’s play The Weekend. Elysia has spent time travelling overseas and has lived in France as an exchange student. After completing Year 12 in 2013, Elysia auditioned for NIDA and was accepted shortly after.